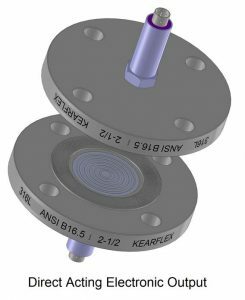 Kearflex offers a line of diaphragms specifically used for isolation applications. This is where there is a fluid fill behind the diaphragm which transmits pressure to a remote, or "isolated" sensor. The sensor can be of any type including strain gauge, piezo, capacitive, inductive and optic. The important characteristic of the remote sensor is that is not suitable for exposure to the wetted media. The process media can be corrosive, high or low temperature and can contain solids. The key attributes of an isolation diaphragm are high sensitivity and the material. The sensitivity allows a very thin diaphragm to pass through the applied pressure with a minimal change. The raw material is matched to the process media and can be 316L, Hastelloy, Inconel, Monel or any other material that can be formed into a diaphragm. In a direct acting assembly the diaphragm displacement with respect to pressure is calibrated. The diaphragm acts like a linear spring and will move a known distance with pressure, and this displacement can be converted into an electrical signal. 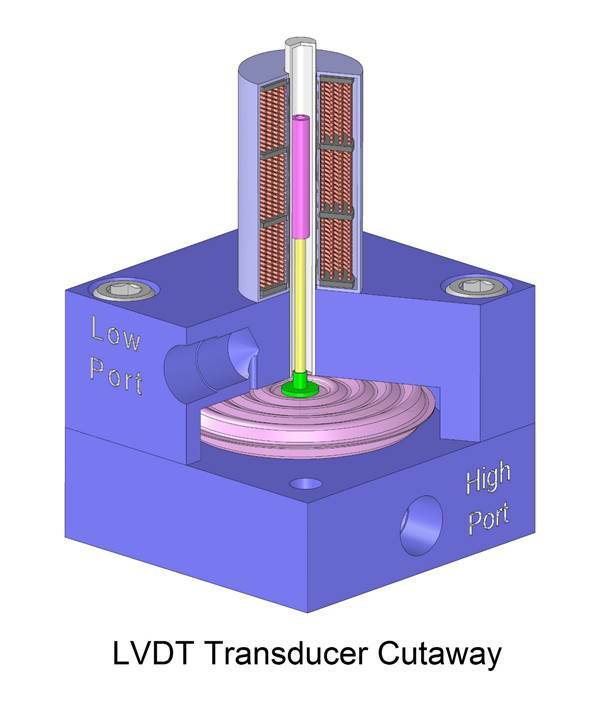 The diagram shows a simple LVDT sensor design. The purple magnetic core moves with the diaphragm and is detected through the non-magnetic wall of assembly. 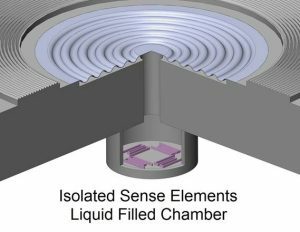 There is no liquid fill as used with isolation diaphragms, and therefore no possibility of contaminating a critical process in the event a diaphragm is damaged. A very sensitive diaphragm can be used which can detect down to a few inches of water column. These are suitable for zone pressure measurement, air flow meters and draft pressures used in vapor recovery systems. 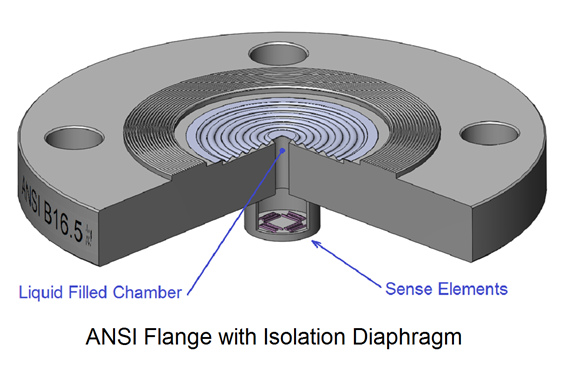 The diaphragm can be interchanged for pressure ranges up to 400 Psi while maintaining the same full scale deflection. The coil itself is not electronic or microprocessor based - it will remain operational in the event of electrical or electronic interference, and is a suitable backup of other technologies. This is useful in very difficult applications such as nuclear or cryogenic installations. For general applications, signal conditioning is usually included in the transducer and will provide a standard electronic interface. This is a differential pressure sensor that can be used with line pressures up to 500 Psi. Pressure connections are remote from the process. 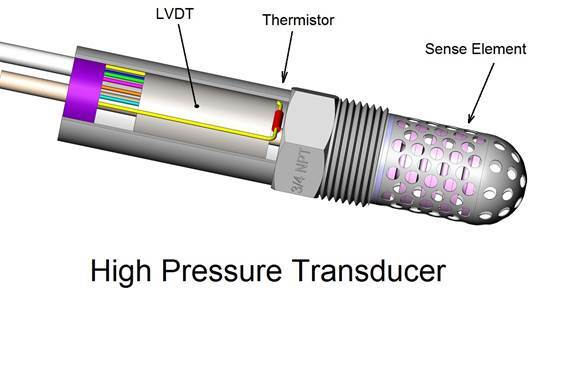 This is an ANSI flanged transmitter that can measure level or pressure, and has no liquid fill. 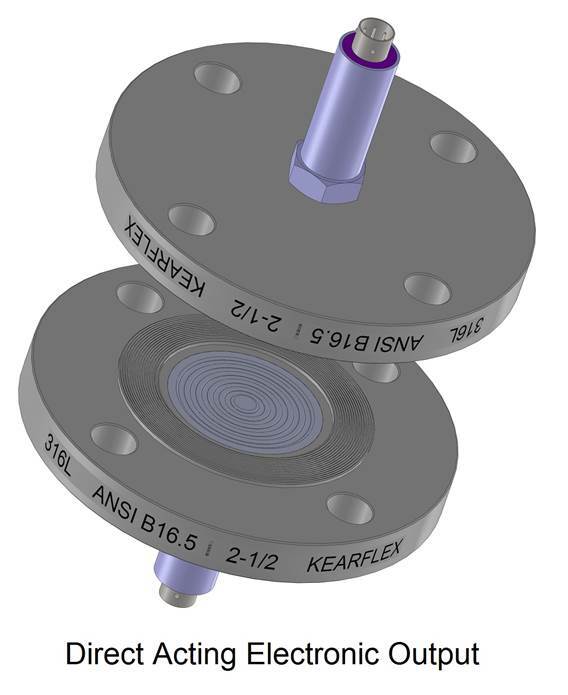 The flange is mounted directly into the process. This is a 3/4 NPT connection that places the sensor directly in the process. 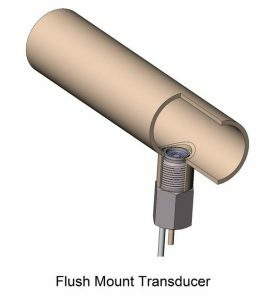 The transducer includes a thermistor for temperature measurement, and is suitable for hydraulic and cryogenic systems. Pressure ranges from 500 Psi to 5,000 Psi. This is a threaded connection that places the sensor flush to the process. The transducer includes a thermistor for temperature measurement, and is suitable for hydraulic and cryogenic systems. Pressure ranges from 20 Psi to 500 Psi.